Trackmaker builds intuition, while supplying background for understanding the chamber tracks and their analysis. Trackmaker is built into OnScreen Particle Physics™. See the summary below. In the Trackmaker session above, the user has injected an electron from the right with the simulated magnetic field set to zero. Then the user has quickly changed the field, using the slide control on the right, to a positive (out of screen) value, capturing the particle on the screen. A quick slide of the field control to a negative value has then reversed the sense of the particle's rotation, and a further increase in the field's absolute value has decreased the radius of curvature of the track. The Trackmaker simulation gives students a feeling "in their bones" for how a magnetic field affects the motion of a charged particle. It makes sense of the rather complicated vector equation that describes the Lorentz force. (Imagine--students don't have to look at their fingers and thumbs!) Students get instant visual feedback (in the form of the altered particle trajectory) on the results of changing the magnetic field. An onscreen tape measure allows you to measure distances on the screen. Combined with the ability to vary the magnetic field and to choose from among three particle velocities, this makes it possible to determine the form of the relationship between particle momentum, magnetic field strength, and trajectory radius (non-relativistic motion assumed). Both positive and negative charges can be viewed. 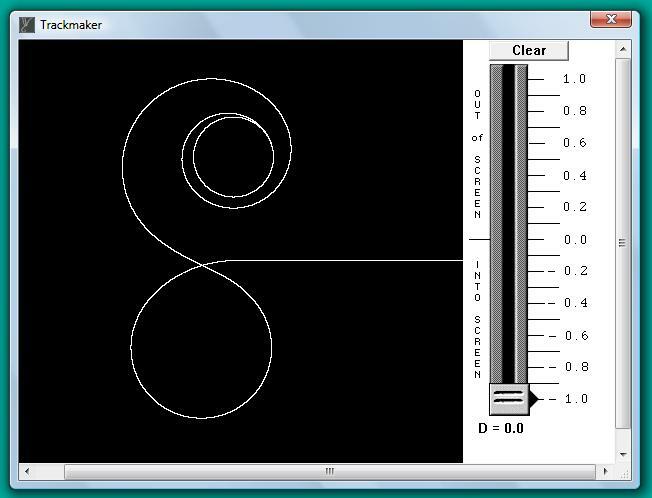 Trackmaker not only is a valuable (and enjoyable) simulation in its own right, it lays the foundation of understanding needed to make momentum determinations in the chamber simulations. It makes sense of the projection views of the events.